Download my content strategy editorial calendar here (no email address required). Watch me plan 5 weeks of content in under 20 minutes? STEP 4 – What’s your posting frequency? If you have a business, you have business goals, right? You’d like to help # people; sell # products or services; make # dollars/month. You’ve probably heard that “content is king” and the importance of content marketing. How a high-quality blog (or vlog or podcast) can increase your reach, establish you as an expert, and set your brand apart from your competitors. So, how do these two things align? How do you make your blog support your business? Today I’ll give you a free (no opt-in required) copy of my content strategy editorial calendar. Then we’ll go step-by-step how to strategize your content to help you meet your business goals. In fact, I’d argue that the ONLY purpose of your blog is to support your business. You need to use your blog content to become the visible expert in your field. To build your email list. And to “warm up” your audience weeks before a big launch. But so many people haphazardly publish content on random topics with random frequency. And this may eventually work. Eventually, you’ll have enough content and have an email list big enough. However, this lack of strategy will just take you longer to get to your business goals. Content is a long-term game. It will definitely take weeks or even years of regular high-quality content to help your business get where you want it to go. But, being strategic will help you reach your business goals faster. You need to plan out your blog post topics around your business. You can make your strategy as detailed as you want, right down to the exact social media posts, email newsletters, and launch sequences. But, that’s not what I’m going to talk about today. 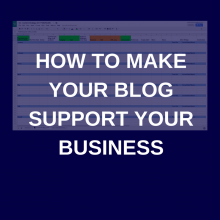 Today I’ll show you how to strategically make your blog support your business. First of all, if you don’t already have one, please download my content strategy editorial calendar here (no opt-in required). 1. To make your own copy of this tracker (if you have a Google account), on the menu bar, click File > Make a copy. If you want to download a copy to your computer, click File > Download as, and then choose the appropriate type of file for your specific spreadsheet program. HINT: I have this on my Google drive, and installed the app on my smartphone, so I can update it whenever I have an update, wherever I am. NOTE: This has been designed specifically for blogs, vlogs, and podcasts (including guest posts on your blog, and being a guest on others’ blogs). If you’d also like to include your newsletter and social media, please, by all means, go ahead and add them! Before you start adding dates and topics into your editorial calendar, think about your audience. Who are you trying to attract and how do you help them? How do you want to represent your brand? What is your end goal for your ideal client? How will you inspire, educate, and entertain them? What do you want your readers to learn, feel and do? What do you help them with, and how do you do it? What products and services do you offer, and how will your content add value to your ideal clients’ lives? Remember: Business first. Content second. First off, add in the dates of your known promotions. What launches do you have planned? What special “health-themed” days do you want to correlate with? What about flash sales for your birthday or biz anniversary? Put those dates in the first column A and highlight them so you can work out publishing dates in advance of them. What’s a reasonable posting frequency for you? Are you able to create content every other week? Every week? Twice or three times each week? Whatever it is now, you can always change it, but most people recommend every week (or every other week) at the very absolute least. COLUMN A. Feel free to add (or subtract) rows to the number of monthly posts you want to create. Start roughly drafting dates, categories (if using), and topics for the next 3-4 months. If you’re using my editorial calendar, these would go into COLUMNS A, E, F & K (highlighted in green). NOTE: I’ve included “comments” on the headers of most of the columns, just hover over the column headers (in row 1) to see them. Don’t worry about the details, it’s just a draft right now. You can make them “sticky” (you MUST get that out on that date) or “fluid” (flexible and can be bumped if something comes along). NOTE: Every piece of content should have a purpose and a call-to-action (CTA). For example, several weeks before your planned launch you want a series of posts/vlogs/podcasts that lead up to it. These will nurture your audience and help them to understand the value of your soon-to-be-launched product or service. Also, consider your blog categories – Do you want more content in a particular category? You can use your biz goals to decide on content with that CTA (e.g. if you want a certain # of discovery calls, make sure you plan out content that has a CTA for people to schedule a discovery call with you). Now you’re going to fill in the blanks for the next few months. If a column doesn’t apply to you, then hide/delete it from the sheet. You don’t need to decide on an exact keyword/title/slug until closer to your publication date (highlighted in orange). What ideas do you have that you still haven’t gotten around to? What questions have you been asked by your audience? What were your most visited posts in the last few months? What were people searching for when they found your site? Check for the most popular search terms. What were the most popular topics in your niche in the last few months? Check BuzzSumo for what got the most social traction. Do you want to create a “series” on one topic? Perhaps for a future ebook or program? Do you want to invite a guest blogger to your site? Use the “Ideas & Brainstorming” tab of the spreadsheet to collect your ideas, especially if they don’t fit into the next 3-4 months. 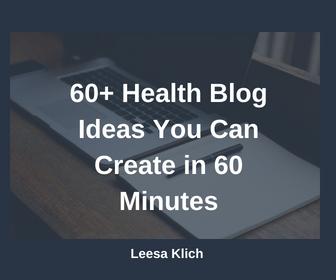 If you’re struggling for topic ideas, I created a list of 60+ wellness blog ideas you can create in 60 minutes that you can download here. They’re not headlines, they’re actual ideas to prompt you to come up with a topic to write about. TIP: Once you’ve planned out the next 3-4 months of content, you can consider batching your content creation to be more efficient. This is a strategy to help you make your blog support your business. Of course, you want to meet these targets. And even if you can’t do it all yourself, you can outsource some of your content creation (I do health writing and content strategizing for wellness professionals, if you’re interested). But don’t forget, you’re ultimately in charge of your blog, website, and wellness business, so make CEO-level strategic decisions and move on with your biz. Nothing works if you don’t use it. Once again, click here (or on the image below) to go directly to the free content calendar to download (no opt-in required). I hope that you use a content strategy editorial calendar. Strategic planning and execution are how to make your blog support your business goals.